Volvo's Extreme Gravity Car is a radical styling exercise for the company. Volvo, more commonly associated with high quality, if somewhat bland cars has produced some interesting concepts over the recent years. Volvo's gravity car has no propulsion mechanism whatsoever except for the pull of gravity, and the car is constructed from lightweight materials such as aluminium, carbon-fibre and fibreglass giving it an anorexic weight of 15 kgs. Every inch of the racer has been optimised for aerodynamic performance, and to decrease rolling resistance the two main wheels are in-line - at the extreme front and back of the vehicle. The rider lies face down inside cramped bodywork with their head just behind the front wheel, steering is controlled by handlebars attached directly to the front axle, and braking is done by a trigger on the left handlebar. 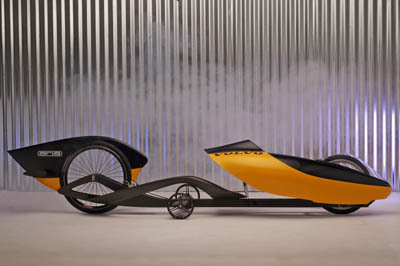 Volvo's gravity car can reach 35 mph within 100m, and tops out at around 40 mph.